Survey respondents clearly recognize that the job of senior executives today involves collaboration within their agency, their department, and the federal government, as well as with key external partners and stakeholders. This report, which continues the IBM Center’s long interest in collaboration, provides valuable insights into how federal senior executives view collaboration. Based on survey responses from over 300 members of the federal Senior Executive Service, O’Leary and Gerard found—to their mild surprise—that nearly all those surveyed report using collaboration as a management strategy. Survey respondents clearly recognize that the job of senior executives today involves collaboration within their agency, their department, and the federal government, as well as with key external partners and stakeholders. The O’Leary-Gerard survey of federal executives is unique in that it received open-ended answers from respondents about how to collaborate in government more effectively. 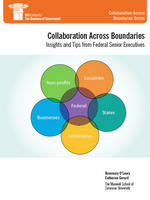 The report concludes with eight insightful tips about how to collaborate in government, including the view of senior executives that the foundation of success in collaboration is common purpose, while another is “don’t be afraid of conflict—expect it.” The report also includes valuable insights into why agencies collaborate, the barriers to collaboration, and the skill set needed to be a collaborative manager. This report adds to the knowledge we have gained from prior research reports by the IBM Center for The Business of Government on the important topic of collaboration. Earlier in 2012, the IBM Center published Designing Open Projects: Lessons from Internet Pioneers by David Witzel, which examines how individuals can work virtually across organizations and sectors on collaborative projects. This follows a 2011 IBM Center report, Designing Collaborative Networks: Lessons Learned from Public Safety by Jane Fedorowicz and Steve Sawyer, which examined collaboration and networks at the local public safety level. This is the second report by Rosemary O’Leary for the IBM Center on collaboration. In 2007, Professor O’Leary wrote (with Lisa Blomgren Bingham) A Manager’s Guide to Resolving Conflicts in Collaborative Networks. Read together, the 2007 report and Collaboration Across Boundaries provide highly useful information to government executives at all levels on how to collaborate, and on how to respond to conflicts that can arise during such collaboration. Listen to her interview on Federal News Radio.